Extremely durable and multifunctional files in a wide range of formats and designs. It is impossible to overestimate the value of a good and easy to use filing system for an organisation, which considers a reliable filing system to be of vital importance, even though it is not part of its core business activities. A good system is well-organised, accessible, flexible and user-friendly and makes efficient use of available space. 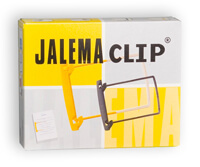 The heart of the Jalema system consists of extremely durable and multifunctional files in a wide range of formats and designs. Because these files are filed laterally, that is diagonally, on a profile, they save up to 40% of the space taken up by traditional storage systems. Compared to flat file cabinets, you can store 3 to 4 times more files in the same amount of floor space. Dust, creases, folds and scratches are disastrous to all types of image carriers. The Job-files all feature both a normal pocket and a second pocket with a dust flap. This allows you to keep lithographs etc. dust-free and separate from other work materials. The file sizes are tailored to the most common printing press formats. The Job-files are constructed of brown 230 gram Whitekraft cardboard while the insides are lined with a smooth, white layer. 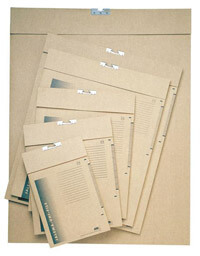 The largest file is constructed of 300 gram Whitekraft cardboard. All the files have a clear imprint. Unlike Job-files, Uni-files only have one pocket, which naturally has a special flap for safe and dust-free filing. Uni-files are thinner and less expensive than Job- and Repro-files, but are just as strong and functional. The two largest formats and the 5228100 are constructed of heavier 300 gram Whitekraft cardboard. Ideal to file flexographic clichÃ©s.